I was originally going to do 10, but I got a huge response back when I asked which golfers my subscribers would like me to analyze. So that’s a pretty good mix of golfers, I’m sure you’ll agree. There’s a couple of lefties. A couple of women. Some swings from years gone past and some current swings. Have a scroll down and look at the swings, and see if you see any key similarities in them. But take careful note to see if most of them move their head only 1 inch. That statement was in terms of lateral movement of the head. So don’t worry about the head moving down. That should happen in a good swing. To start things off, Adam Scott has a very still head as he swings. There’s clearly quite a lot of head movement from Ben in this swing, to the left during the backswing. Then in the downswing he moves his head back to a place close to where it was at setup, although naturally lower. One of Jack’s famous fundamentals is to keep the head still. So it’s no surprise that his head remains pretty much in the same place as it was at setup throughout his swing. Tiger’s head movement looks a lot like Rory’s. That swing was from 2001 when I think Tiger was swinging his best. Looks like similar head movement to Tiger above. 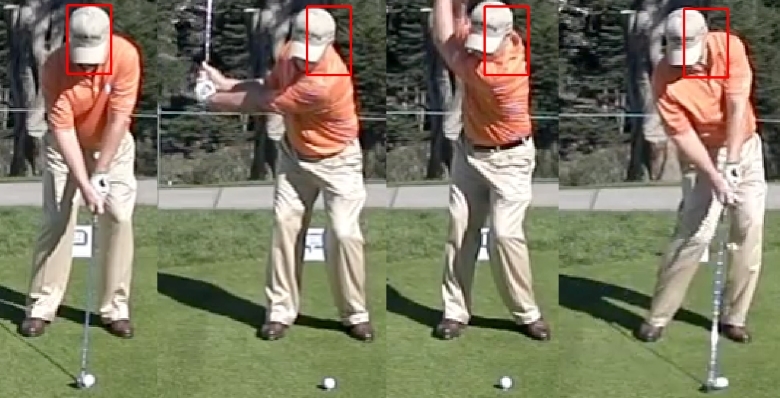 Moves the head to the left in the backswing and then at impact the head is quite a bit behind where it was at setup. Greg is known as one of the best drivers ever, and he has quite a bit of head movement to the left (his right) in the backswing and at impact his head is to the left of where it was at setup. This is the only swing that I have included the finish. And I only did that because of how interesting it is. Arnold moves his head all over the the place doesn’t he? And if you notice, he’s one of the few golfers who has is head in front of where it was at setup. Like Arnie, Gary at impact has his head in front of where it was a setup. It’s interesting that half way into his backswing Fred’s head moves fractionally towards the target. Then at impact the head moves away from the target. Ok, so what can we make off all of that? Well, the reason I did this was to verify the statement that “the average PGA Tour player moves his head only one inch during the swing”. Upon doing this analysis I can’t see that being true. If you just took the averages of the 23 swings analyzed above I would say the average would be 2-3 inches at least. So 3 golfers out of 23 fulfilling the 1 inch average does not seem very good to me. Now here is a list of golfers who move their head about 3-4 inches (about half a head) at the top of the backswing position. 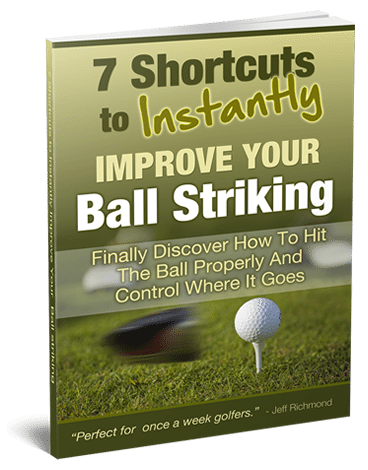 8 out of the 23 golfers featured move their head at the top of the backswing by about 3 – 4 inches. But what’s really important is impact. And it’s pretty easy to see looking at these swing pictures that MOST of the golfers above have their head to the left (when looking face on) of where it was at address. 13 golfers have their head to the left at impact compared to where it was at address. 7 golfers have their head in pretty much the same position it was at address, but lower naturally. 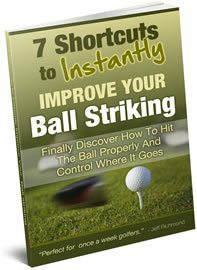 Ok, after seeing this and teaching a golfer what to do in terms of head movement what would I do? Well, the ideal I think would be to have very little movement during the swing until impact. But if you err on the backswing you can allow up to half a head of movement on the backswing to the left. Then at impact you want your head to be where it was at setup or to left (away from the target). The bottom line in this is that if you fall within the parameters I’ve given, then I wouldn’t worry about head movement. For example, if you analyze your swing and see that your head moves half a head to the left at the top of the backswing then you may think you need to limit that movement because it’s way more than 1 inch of movement. But then you have guys like Ben Hogan, Sam Snead, Ernie Els etc. that do exactly that. Now if you move your head more than them on the backswing, I would suggest you work on keeping your hear more centered. As you’ve seen from the swing analysis. Your head doesn’t need to be perfectly still. Obviously what happens at impact is key. And from this analysis I would tell a golfer to either have their head at a similar place to where it was a setup or behind (to the left of) that mark. It was very interesting doing this swing analysis. I hope it’s cleared up what you should be looking for in your own swing when you look at head movement. And if only 3 golfers out of 23 keep their head perfectly still during the swing, I don’t think it’s a huge fundamental or something you should worry about, UNLESS you’re outside the parameters I have outlined.